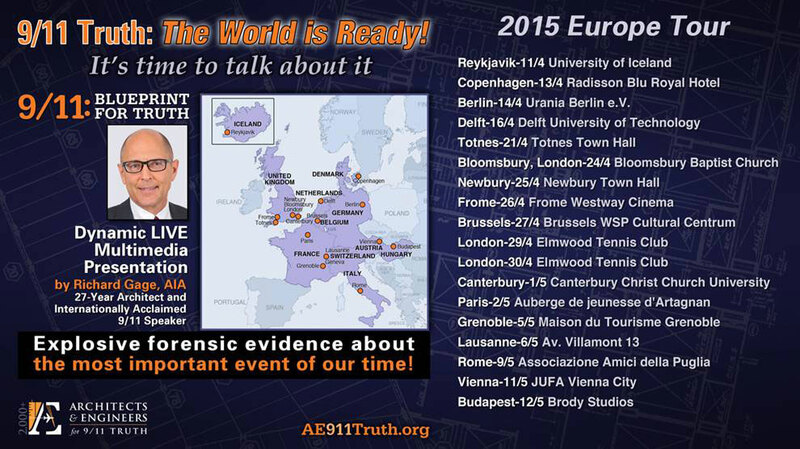 In a few days, Architects & Engineers for 9/11 Truth founder and 28-year professional architect Richard Gage, AIA, embarks on an intensive month-long speaking tour that is designed to illuminate Europeans on the facts of the destruction of the three World Trade Center skyscrapers on September 11, 2001. Armed with unbiased expert analysis and eyewitness testimony, Gage exposes major flaws in the official 9/11 narrative, upon which a dubious perpetual war on terror and erosion of civil liberties across the globe has been predicated. Mounting death tolls, stratospheric military spending, and widespread government insolvency are prompting citizens of all countries to call for a closer examination of the evidence of the catastrophic events of 9/11 — events that have been the impetus for these planet-wide ills. Gage is answering the call for a multi-nation tour that starts on an island in the North Atlantic Ocean, wends its way south to the Mediterranean Sea, heads back to another island in the Atlantic, and ends in a landlocked Eastern European country. He’ll make his presentation in unique venues that provide the opportunity for frank discussions about one of the most pivotal, controversial events in modern history. For the rest of the tour dates and info, read the article online here. We'll keep you updated on the tour via social media on Facebook and Twitter.